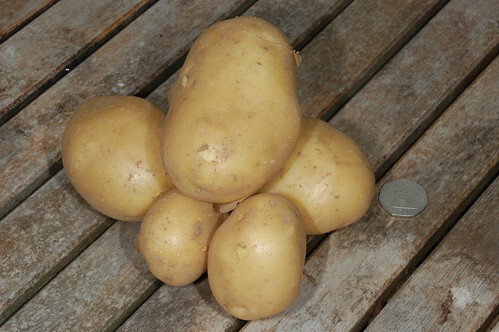 We had a bit of a shock at the end of June; some of the potatoes were showing signs of what appeared to be blight, despite having had two preventative sprayings with Bordeaux mixture and relatively dry calm weather for a couple of weeks. Most worryingly it was just one variety of potato that seemed to be affected initially, not just one plant but most of the row equally. It looks as if the infection came in on the tubers and not the wind. Unfortunately, once blight has arrived there's little that can be done to stop it spreading. We've taken up the variety where the problem started and given another spraying across the whole plot to try to control things for a week or two longer. Then I think we'll have to remove the foliage and allow the tubers to harden underground for a couple of weeks before an early harvest. If the weather stays dry we should still get an adequate crop although the Pink Fir Apple, a very late maturer and prone to blight, may not have time to make much weight. We also cleared the plot of Swift. These first earlies mature reasonably well but there's little point in conserving them, their day has been and gone and the last tubers need to make way so that the area can be cleared. The eating quality is only average, the value is in the extreme earliness of the crop. Next year I think we'll try my old favourite Epicure or one of the newer varieties like Orla. 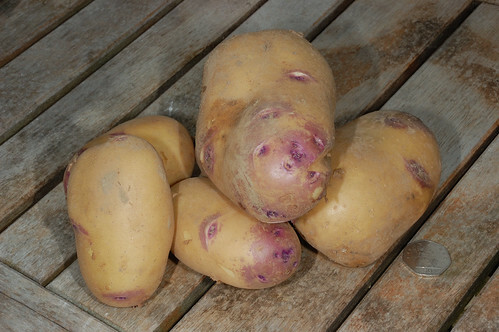 Stroma is one of our favourites, very strong plants which seem to show some blight resistance, reasonably early and clean pretty red skinned tubers which cook well. Kestrel is the potato that started the trouble this year. Nearly the entire row was affected even though adjacent Stroma still looked well. However, there were signs that the problem was spreading even in the couple of days we hesitated while deciding what action to take. Kestrel is recognised as having poor blight resistance. We've had quite variable experiences with Kestrel. The first year we grew it the potatoes were so iron hard and apparently uncookable I said I would refuse to ever grow it again, but I was persuaded to give it another try because of its excellent slug resistance (figures!) and the following crop was really quite useable, stored well and made reasonable returns. This year we've had to hook them all out early. 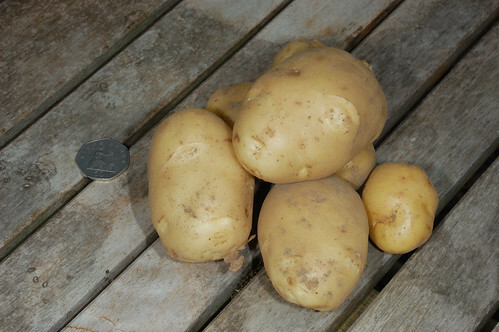 The yield isn't too bad considering they could have done with another month and the tubers look clean and healthy enough although the skin is very soft. But, a trial cooking has revealed that this year's spuds have a somewhat bitter aftertaste when boiled, although we didn't notice this so much when we chipped a few. The jury is still out. We first tried Ambo from a few odd potatoes left over from a supermarket bagged purchase when we had just taken on an allotment in Newport Pagnell and I think we've grown them every year since. 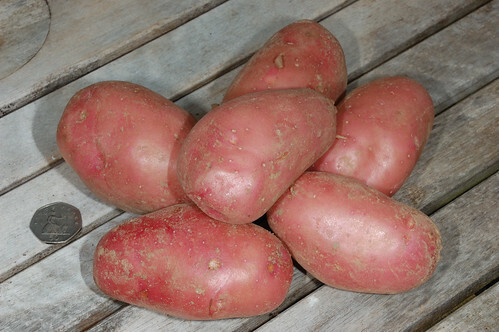 A very reliable potato, genuinely all purpose, making nice roasties, fluffy bakers, mash and salad as required. They show some blight resistance and store well too. The few in the picture are from a single plant we took up as a trial and are still quite small. 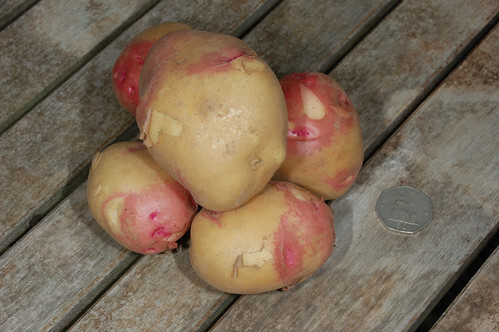 Again one trial plant produced these tubers. They really need that extra month or six weeks to bulk up. British Queen make the best chips, we're both agreed on it and we chipped these. Even fresh from the ground (and chipping potatoes are usually stored for a while before use) and barely mature they made a wonderful plate of golden goodness, needing little more than a sprinkle of salt. I hope we can keep the blight away long enough to get a lot of these.